Cookies are a huge hit at our house, especially ones with chocolate chips in it. Actually, anything with chocolate chips is a huge hit at our house. As much as we enjoy cookies, I don’t make them often because there are other baked goods and healthy snacks for kids that are better for them. I know you might be scared to use lentils in your cookies, but trust me on this – these cookies might not look so pretty, but they come out of the oven soft, fudgey and moist. 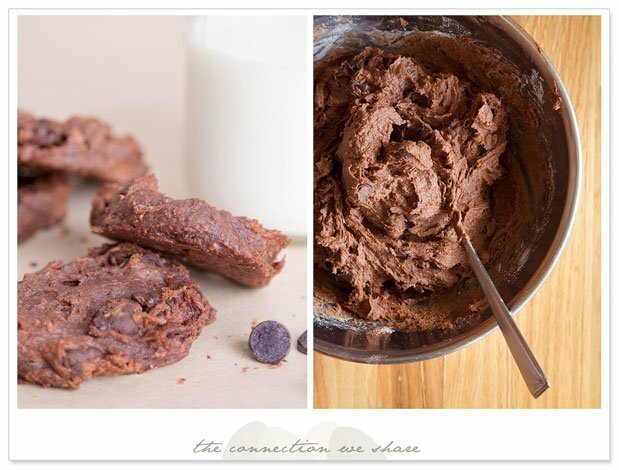 It’s the lentils that gives the cookies its fudgey texture and the nut butter gives it a lot of flavour. These cookies are super easy to make. You literally just throw everything in the blender or food processor. The hardest part is trying to scrap all the batter out of the machine. When you make this the whole mixture is really sticky. It might be helpful to put a little bit of oil on your hands when you want to flatten the cookies a bit. I find they don’t really rise or spread so how you shape them is how they’ll come out. One thing I have to note is these cookies aren’t very sweet. It’s the chocolate chips that gives it its sweetness. If you like sweet cookies, I’d recommend using 1/2 cup of brown rice syrup or maple syrup. Really, give these cookies a try. I feel these are way better for you than the traditional cookies. If you’re concerned about nut allergies, try using sunflower butter instead of nut better. But just a disclaimer, I’ve never tried this recipe with sunflower butter, I think it might work because of its high oil content much like nut butters. If you do, please let me know how they turn out. Combine lentils, cocoa powder, vanilla, peanut butter, brown rice/maple syrup and baking powder in the container of a food processor. Process mixture until very smooth. Transfer mixture to a bowl and stir in dark chocolate chips. Spoon 1 tablespoon of dough on parchment-lined baking sheet. Press and flatten to desired height. Bake at 350° for 15 minutes. Amy Lee is tea lover, chocolate eater and a kale chip maker. She loves to spend time with her kids and crazy kisses them whenever she can. On her blog The Connection We Share, she shares photography tips, healthy snack recipes, fun crafts for kids and her journey to become a better mother. Every month, her and her daughter look forward to the arrival of their Kiwi Crate craft subscription box. The activities in the craft box are tools for them to bond and connect, building a stronger mother-daughter relationship. Previous Post: « Chicken Soup for The Soul: From Lemons to Lemonade. When Life Hands You Lemons, Make Lemonade! I have never thought or even heard of using lentils in a cookie recipe. I will have to try these. This is a great recipe, I love sneaking veggies into "treats" any way I can. Thank you! These look yummy! These look so tasty. A great after school surprise. Oh yum! these look like fudge to me…which sounds super tasty. The dough looks delicious!! 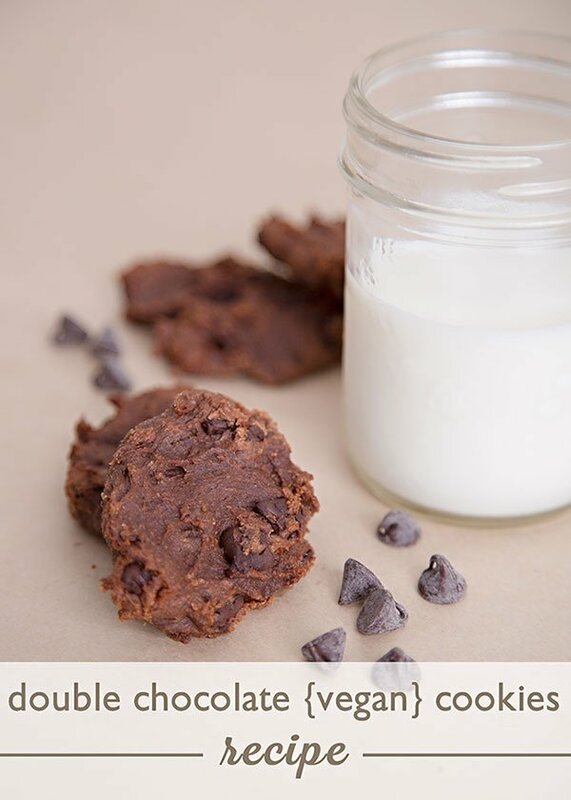 And who knew you could use lentils to make cookies?! I love the easy way to sneak in something like lentils! The kids aren't going to have a chance to protest. Holy smokes! You had me at DOUBLE CHOCOLATE!!! These look amazing! I'll try making these sometime this week! I'm so curious to try these when I get a chance! They look delicious! For some reason this almost remind me of a pone. I would love to taste these! Awesome! I'm pinning this – thanks! You had me at chocolate. Seriously. Love the use of lentils in these too. It's amazing how versatile lentils are. Oh my goodness. These sounds super delish! I love all things chocolate and so does my three year old. Still trying to convert my 8 year old. Definitely bookmarking this! GASP! I love lentils and would have never thought of putting them in cookies! My kids love them too, so I should try your recipe! Interesting! I'd never heard of lentils in a cookie recipe. Thanks for sharing your Double Chocolate Vegan Cookie recipe. Wow! I love lentils, in fact, I'm soaking some now to cook later. I never thought about making cookies with them, but this one I must try asap!!!! I typically have them as a side dish, or put in soup, etc., like most people, but I like incorporating beans, lentils, etc. into as many dishes as possible – now cookies, too!!!! They look delish!